For use with the OneTouch® Ultra® Family of Meters, OneTouch® FastTake® Meters, and InDuo® Systems to check that the meter and test strips are working together properly and that you are performing the test correctly. 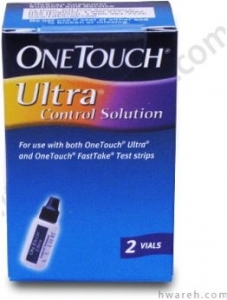 OneTouch® Ultra® Control Solution contains a known amount of glucose that can be tested with OneTouch® Ultra® Test Strips and OneTouch® FastTake® Test Strips. The test results you obtain should fall within the expected range of results you will find printed on the vial of test strips you are using. CAUTION: The control solution range printed on the the test strip vial is for control solution only. It is used to test meter and test strip performance. It is not recommended range for your blood glucose level. - to practice the test process, instead of using blood. - when you begin using a new vial of test strips. - at least once a week. - whenever you suspect the meter or test strips are not working properly. - if you have had repeated unexpected blood glucose results. - if you drop your meter. The control solution consists of glucose (about 0.11%) in a water solution containing a stabilizer, preservative, viscosity adjusting agent and a red dye. Amount supplied is sufficient for 75 tests. - Use only OneTouch® Ultra® Control Solution with the OneTouch® Ultra® Family of Meters, OneTouch® FastTake® Meters, and InDuo® System. Write the discard date (3 months after date opened) on the vial when first used. - Do not use after the expiration or discard date, whichever comes first. - For in vitro diagnostic use. CAUTION: Do not swallow control solution, it is not for human consumption. Do not apply control solution to the skin or eyes as it may cause irritation. WARNING: Keep the meter and testing supplies away from young children. Small items such as the battery door, batteries, test strips, lancets, protective disks on the lancets, and control solution vial cap are choking hazards. Close the bottle tightly and store at room temperature below 86° F. Do not refrigerate. Read the instructions carefully in your owner's booklet to perform the control solution test. 1. Control solution tests must be done at room temperature (68° - 77° F). 2. Shake the control solution vial well before testing. 3. Discard the first drop of control solution you squeeze out and wipe the dispenser tip. 4. Apply the drop of control solution to the narrow channel in top edge of the test strip. At room temperature, OneTouch® Ultra® Control Solution test results should fall within the expected range printed on your test strip vial label about 95% of the time. - An error in the way you are doing the test. - Expired or contaminated control solution. - Damaged or expired test strips. - Use of the test strip or control solution past its discard date. - A problem with the meter. - Control solution that is too warm or too cold. - Failure to shake the control solution vial well. - Failure to discard the first drop of control solution and wipe the dispenser tip. If you have any questions about this product, please call LifeScan toll-free at 1-800-227-8862.